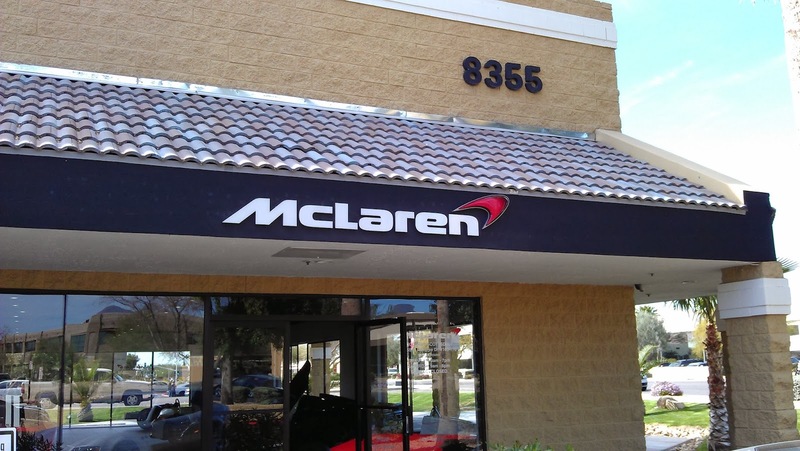 Having first sighted the adjoining McLaren Service side of the building, around the corner Miguel spotted the McLaren Scottsdale building and we knew we were in the right place after he'd spotted the reserved for McLaren parking sign - which naturally we parked away from. 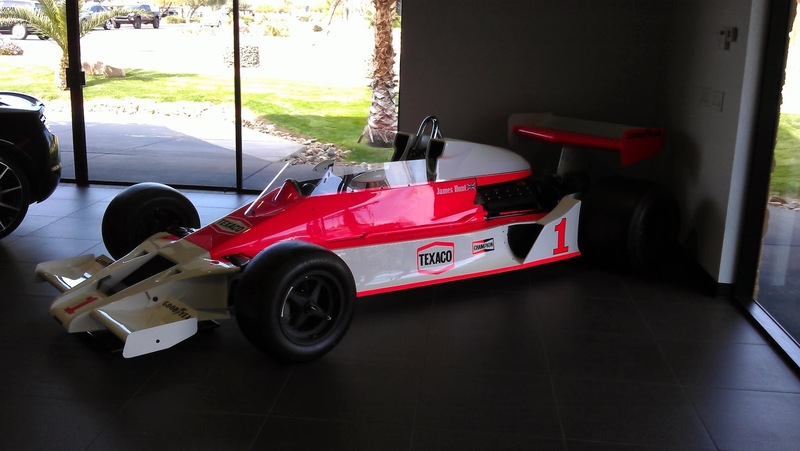 Entering the building we unexpectedly spied a McLaren M23 racecar parked there, and I say unexpectedly since it sported the number one of James Hunt upon it - as in the late 1976 Formula 1 world champion James Hunt! And as we stood there transfixed, a very pleasant, friendly Salesperson approached us to which Miguel enquired if it was okay to take pictures? To which Gina said warmly: Absolutely! And then proceeded to tell us the story of a man seeing the lone M23 chassis from the street and breathlessly coming inside to view it simply Awestruck while Gina told him to take a deep breath, the car will be here on display for two-years... As next Gina offered to take a picture of the two of us standing in-between the M23 and the corresponding MP4-12C before she left us standing there. Thanks to Miguel's attention to detail, or as 'Ol 'Hobbo, aka David Hobbs would say: that boy's got the eyesight of a proverbial rat! Over the course of our visit he'd point out three astute details to me, of which I'm certain would make thee 'Ronster (Ron Dennis) smile - which after telling me about the Avon slicks Hunt's mount was resting upon he read the words Nicholson McLaren off of the ubiquitous 'Cossie's cam covers... Which definitely left me puzzled since the Ford Cosworth DFV was the engine of choice during the 1970's. Moving onto the vehicle we'd come to see, as we marveled over the Black Beauty; Err Beast, Gina returned to see if we had any questions? As Gina definitely knew her stuff as I asked her a few questions, inquiring if they'd be getting any P1's to which she quickly told me were already sold out, although perhaps two would be delivered there to awaiting buyers, albeit she really wasn't certain of this... As I find the story of how Bloody 'Ol 'JENSE (Button) is currently upon the waiting list in case anybody's order falls thru hilarious! 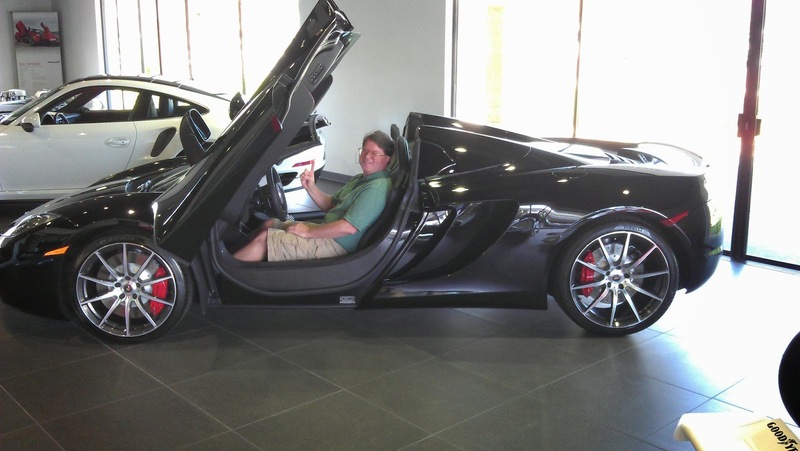 Ah, but let's get to the meat 'N potatoes of this story, as after all, as I've already mentioned, the sole reason we'd came to McLaren Scottsdale was to oogle over the stunning MP4-12C road car, to which all I can say, is that the "DO NOT TOUCH!" Signs should probably include something about NO drooling either, eh? And although I've known of the MP4-12C's existence for awhile, to which now is simply called the 12C, of which I've discovered that the "C" appropriately stands for Carbon, as in F1's de riggour usage of carbon fibre, I've probably done the car a huge disservice by denoting it as McLaren's "Entry level" Sports Car - having derived this from the fact that the ultra-rare P1 is currently at the top of the McLaren Pyramid while the soon to be released 650 will sit above the 12C, with the 650 slated for introduction to the public at the forthcoming Geneva Auto Show. In true Formula 1 fashion, the 12C's modest weight is largely due to the extensive use of carbon fibre for its production, starting with what McLaren calls its Carbon "MonoCell," the chassises single piece cockpit tub that weighs just under a svelte 80kg (176lbs) and is manufactured by Carbo Tech of Salzburg, Austria. Hmm? Perhaps Y'all have heard of them? As it's the same outfit who previously were sub-contracted in the production of the Hispania F1 car, with McLaren Automotive having awarded them a $150m (Euros) contract to produce their entire range of forthcoming automobiles composite monocoques, with Carbotech producing up to 4,000 units yearly. And impressively, there just so happened to be a carbon fibre MonoCell "Demo" (Demonstration) vehicle situated in the showroom, which Gina explained was designed to show potential customers what was underneath the skin of the 12C's beautiful bodywork - noting that they'd taken two 12C's plus the MonoCell "Demo" unit to the recently concluded Barrett Jackson Scottsdale auction with both versions receiving nearly identical viewing. Next came the first of many surprises, when Gina said that she thought I needed to sit in it! 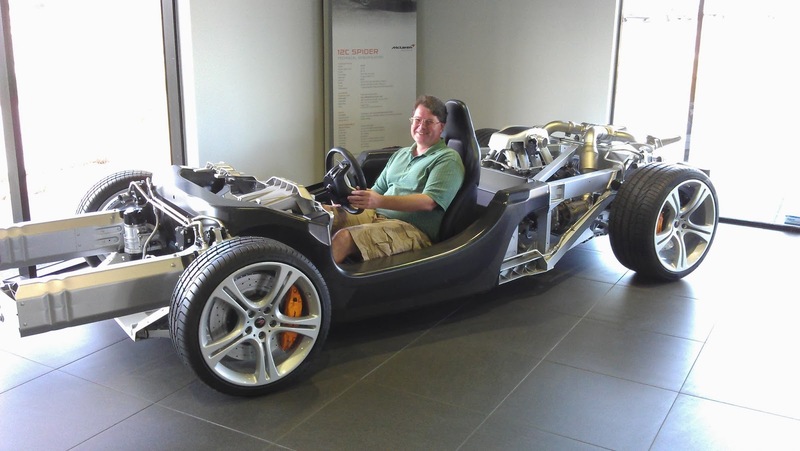 As she described what she thought was the best method of my inserting myself into the MonoCell's cocoon, explaining that the two most solid points of the chassis were the door frame's large carbon ledge and the steering wheel. Gina then directed me to place my Bum' upon the spacious ledge, grab the steering wheel, pivot my derriere, swinging my legs in concert and then slide myself into the driver's cell of which I managed to do in a fairly neat maneuver, finding myself seated inside said McLaren monocoque - having my picture taken! Then Gina further surprised us by saying well done; now I think he needs to sit in the actual car; EUREKA! Let me go get the key for the retractable roof which she coolly explained takes only 17-seconds to fold neatly into its compartment behind the cockpit and above the engine, as I believe she claimed that it can be operated at up to speeds of 30mph but dryly noted that you could just store it while stationary at a stoplight. Returning with key in hand, Gina quickly lowered the 12C Spyder's top and then talked me thru how I'd need to be careful of the car's "Lambo" style (Lamborghini) scissor doors, although I believe that McLaren prefers to denote them as Dihedral doors instead. Once again repeating Gina's instructions upon how best to enter the automobile, minding me to watch my head upon the now opened door, I somewhat gracefully executed the same maneuver before and wallah! Your humble No Fenders scribe was seated behind the wheel of a true honest-to-goodness 12C Spyder; Aye Karumba! As Gina shut the door while I just sat there laughing myself silly as Miguel snapped a few more pictures of Mwah! And what can I say about this car? Being in full sensory overload, all I could ask Gina was; are those paddle shifters as my hands clutched the solid wheel while my fingers caressed the corresponding toggles lightly... As the 12C indeed utilizes its own seven-speed Seamless Shift transmission operated by the requisite paddle shifters of all modern Supercars these days. And my initial feelings were that this Awesome car didn't disappoint, as the sumptuous black leather stitched bucket seats were supremely comfortable to sit in as I tilted my head back into the headrest of the one-piece seat, as this was the only choice to match the bitchin' Sapphire Black exterior paint! the steering wheel felt chunky, but solid and everything seemed within easy reach. And although you'd expect this level of fit, finish and feel, nevertheless I was suitably impressed with the solidness of the cars electric window switches, which Gina let me operate after asking if my foot was on the brake when I couldn't get it to work momentarily; but hey! As Yuhs already know, I'm visually impaired and Gina was trying to walk me thru this simple step from the opposite side of the car - as the window quickly went down gracefully once I'd found the correct switch lever! The other two items that Miguel spotted were the McLaren-McLaren cam covers and the dual disc calibers of the 12C's mondo rear wheels, correctly noting that one was smaller than the other, having since learned that this is the very clever adaptation of McLaren's fabled brake steer system ironically discovered in the MP4/12 racing car 'Wayback in 1997, designed to alleviate understeering tendencies in the racecar which was subsequently banned in Formula 1. And while the 12C doesn't share any similarity with this past F1 chassis, nevertheless I'd be willing to guess that there was some intended name recognition planned by the careful use of the company's first road car's nomenclature in 21-years. As McLaren has now designed a computer controlled version of said system for use upon the 12C road car to "brake-steer" the rear of the car from understeer in fast corners, along with wheelspin in the car's suite of electronic driver aids. And while I'd thought that the 12C used some version of a Mercedes powerplant, I was surprised to learn that instead, the car utilizes McLaren's very first ever own designed engine, as the M838T is a development of the 3.8-liter Tom Walkinshaw Racing developed Nissan engine used at the 1998 24 Heurs du Mans, although the only thing it shares in common with the engine TWR reputedly developed for intended usage in the Indy Racing League is its 93mm bore... Having also learned that this very same engine serves as the base motor for the P1 Supercar, albeit being modified to accept the P1's hybrid motor application. Having had the privilege of sitting in the 12C, I can only think of two things that would have made this better, these obviously being getting to hear the symphonic rhapsody of the M838T performing a full opera concerto from idle to full chat with Bloody 'Ol 'JENSE as my chauffer! Hey, I am allowed to dream after all, right? McLaren M838T 3.8-liter twin-turbo V-8 engine. 616bhp @ 8,500RPM; 443 ft lbs torque. 3,084lbs curb weight; 2,868lbs dry weight. 12C Spyder Base price: $268,250. 12C Spyder Fully loaded: $321,080. Lease price: $3,550 per month; 3500 miles per-year. Electronic top fully retracted in 17-seconds. Kudos to Gina Faye Mundt of McLaren Scottsdale for making my visit so memorable!